I don’t even know how to write this because it still seems so unreal. 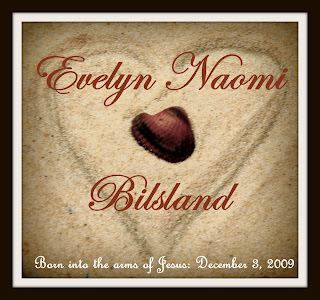 This past Thursday we said good-bye to our baby girl, Evelyn Naomi. She was born into the arms of Jesus December 3rd at 6:47 pm. I carried sweet Evie for 36 precious weeks. She weighed 4 lbs 12 oz and was 17 inches long. She had a full head of brown hair and looked a lot like her big brother Ty. and lay her to rest beside my Granny who passed almost 2 years ago. Baby Evie is healed now and is in a perfect place. David and I have the most incredible families and friends that anyone could hope for. Thank you for all your prayers and everything you have done. We will never forget all your faith and love. Please continue to pray for us as we rely on God to get us through.